At Wendel Clark’s Classic Grill & Bar, we pride ourselves on the rich quality of our food. From one Wendel fan to another, we’re excited to offer Wendel Clark’s patrons a variety of specials and contests to encourage everyone to try Wendel’s favourite dishes from our new menu. Check back here often to find our daily and limited-time special offers. $5 PINTS OF COORS LIGHT AND MOLSON CANADIAN DURING GAME TIME. This will be the year the Leafs break their 52 year Stanley Cup slump. We can feel it. Don’t miss a single game. 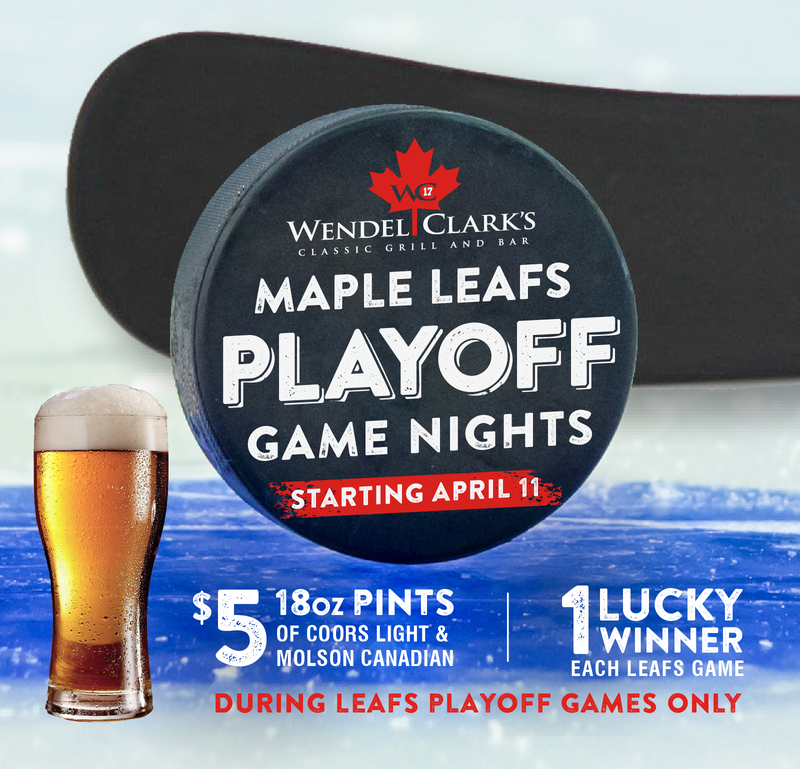 Wendel Clark’s is Leafs Playoff Central! Customers can enter as an individual, or as a pair, but groups cannot exceed more than 2. To enter, customers who order drinks and meals during the game will be handed a ballot, which will ask for basic contact information, including name and email address. Each time the customer or pair order, they are handed another ballot to fill out. The more often the customer orders during game time, the better their chances of winning. All customer ballots will be collected and placed in a basket, where one will be drawn at random upon completion of the game. Looks like this one’s going into OVERTIME! 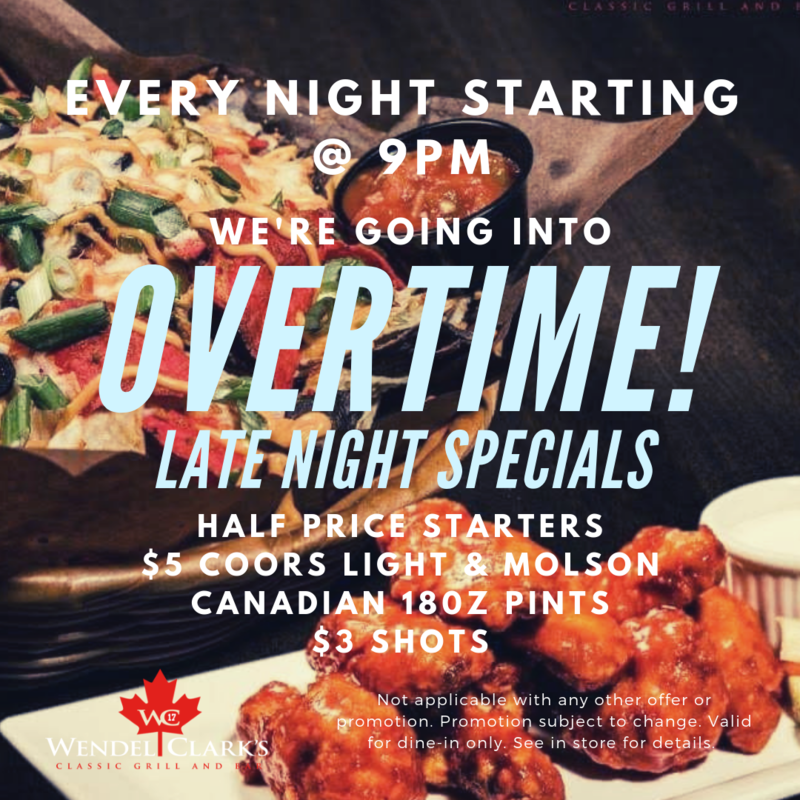 Enjoy a variety of discounted food and drink options from 9PM to close, every single night, at any of our Wendel Clark’s Classic Grill & Bar locations. 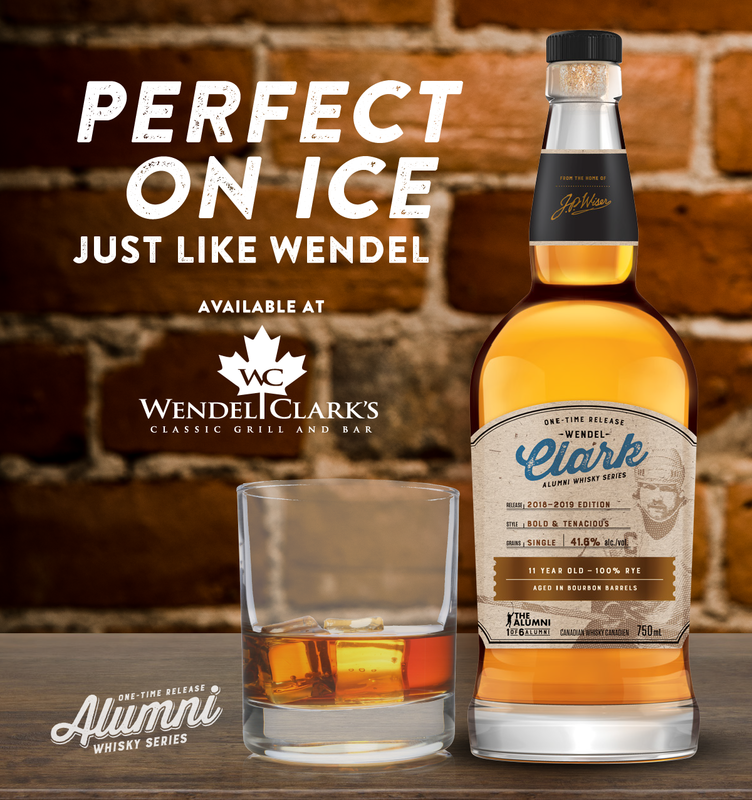 Carefully crafted to match his bold & tenacious playing style then aged in bourbon barrels for 11 years, this ONE-TIME RELEASE J.P. Wiser’s Wendel Clark Alumni Whisky is available for a limited time at all Wendel Clark’s Classic Grill & Bar locations. Don’t miss out. Once it’s gone, it’s gone. Gain Access to Exclusive Contests, Promos & Other VIP Membership Benefits. Click here to sign-up. Join Wendel Clark’s VIP Club to receive exclusive access to sweepstakes, giveaways, special events and yummy deals. It’s FREE! Don’t worry, we won’t spam you. Our promise to you.